How will you show your love this Valentine’s Day? 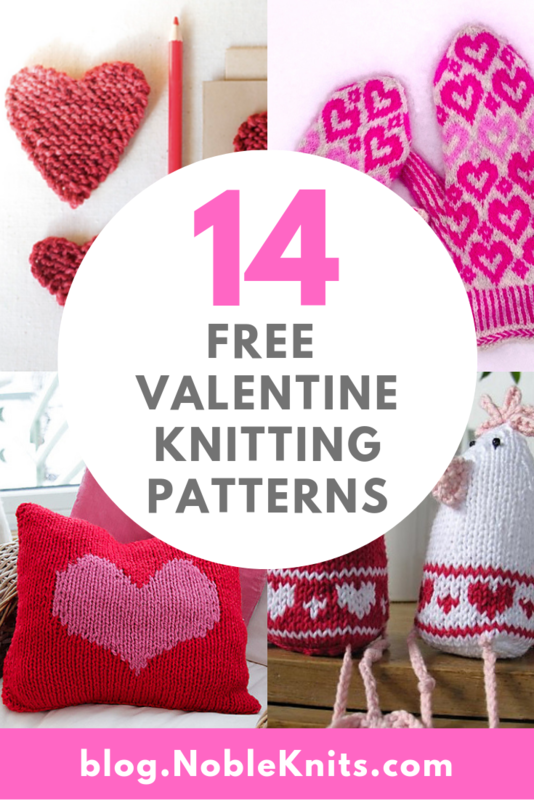 We’ve rounded up 14 free Valentine knitting patterns so that you can stitch your way into someone’s heart. Some of these project are heart shaped or stuffed hearts, while others feature heart patterns in knitting. While a few of these projects are a bit more challenging, most of them are easy knitted heart patterns. Knit a special heart for a friend, significant other, child, grandchild, co-worker, or for charity. #1. Winged Heart Tattoo Free Knitting Pattern by Annypurls. You don’t need a tattoo to profess your love for mom! Knit her a tattoo heart softie that she can cuddle for years to come. #2. Milda Heart Hat Free Knitting Pattern by Claire Slade. If you are new to Fair Isle color work, this is a good project for you. 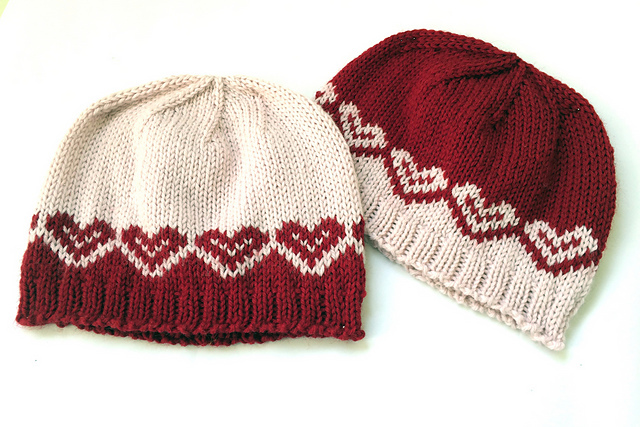 You’ll create these simple stranded hearts on a hat knitted in-the-round on circular needles. #3. Lay My Love Heart Pillow Free Knitting Pattern by DROPS design. 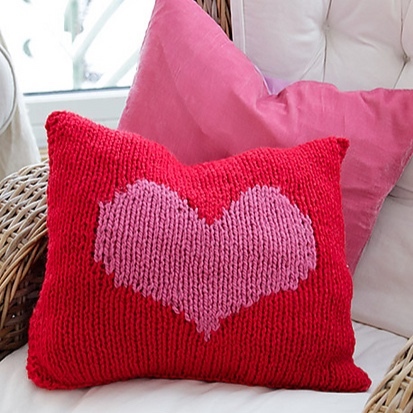 Create a knitted heart motif pattern on a cozy pillow! #4. Heart Cup Cozy Free Knitting Pattern by Julee Mackessy. Knitted in the round, this quick coffee cup cozy warms your heart and hands. #5. Love Heart Chicks Free Knitting Pattern designed by Janice Anderson. Where will you perch these chicks to show your love? The chicks feature a fair isle heart pattern around the body. #6. Valentine Hearts Free Knitting Pattern designed by Elizabeth Murphy. If you’ve ever wanted to knit a tiny heart, this is the project for you. Use this flat knitted heart pattern to make valentine cards, pins, buntings, and more! #7. 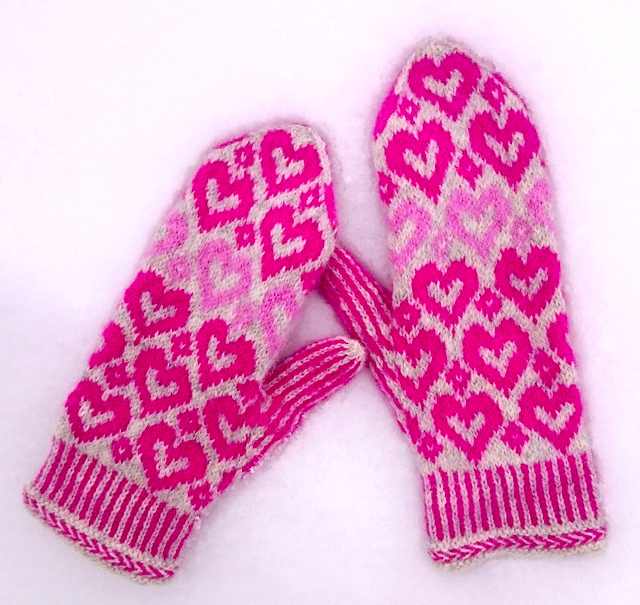 Valentine Mittens free knitting pattern by Anita Viksten. Warm hands, warm heart! This stranded knitting pattern works up fast in a fun to knit color work pattern. #8. Valentine Mail Monster Free Knitting Pattern by Becca Brody. This Valentine monster is ready to spread Valentine love! With a bag full of mail, this adorable monster is sure to become a favorite for children and tweens. #9. Heart Dishcloth Free Knitting Pattern features a heart motif center surrounded by textured borders. The pattern includes instructions to knit a dishcloth version or an entire blanket. #10. From My Heart Scarf Free Knitting Pattern was designed by Karen S. Lauger. It’s a two color project featuring contrasting squares and heart motifs using the double knitting technique. The free pattern doesn’t teach double knitting, but the designer encourages it as a first pattern for double knitting to practice your newly acquired skill. #11. I Heart You Three Times Free Knitting Pattern by Jen Zeyen is a heart shaped cable knitting pattern. These cables are not any more difficult to create than a regular cable, they are just not as easily available. The project features three heart cable edged by side cables and a garter border. Knit one of these washcloths as a gift to show your love three times! #12. I Heart Knitting Hat Free Pattern by Lulustar is full of love! Three rows of heart patterns can be knitted in various colors or using a self striping yarn that changes gradually as you knit the Fair Isle pattern. Brim is ribbed for a snug fit and pattern includes instructions for a fitted cap or slightly slouchy version. #13. Keep Me Searching for a Heart of Gold Socks Free Knitting Pattern by Melanie Starke guides you through knitting a pair of fun Fair Isle socks with heart motif. These socks are knitted in the round from the toe-up and feature heat bands on the instep and a gradient pattern that finishes at the cuff. #14. Hearts for Ruthie Free Knitting Pattern designed by Elaine Fitzpatrick includes instructions to make two heart filled projects; a baby bib or a washcloth. 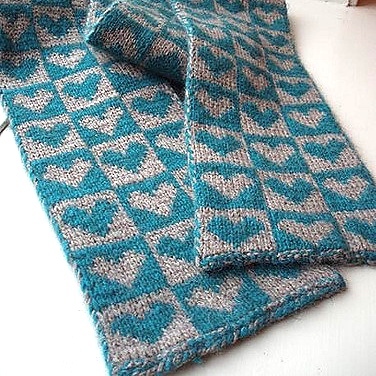 Both designs feature heart patterns in the knitting and are edged with a garter border. Will you be casting on any Valentines this year? Which is your favorite project?